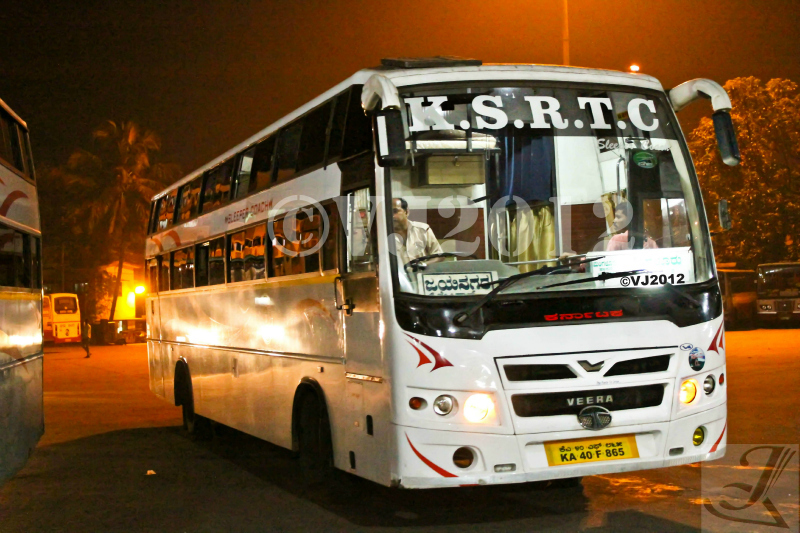 Time and Tide waits for none- so is our KSRTC buses from Mangalore division. I learnt this lesson the hard way on my return trip from Kundapur. Initially I had plans of coming back from Mangalore on Sunday night however due to some unforeseen circumstances, I had to return back to Bangalore by Sunday morning. Hence started my bus hunting session. Since I stay in Vijayanagar(Bangalore), I was looking for a bus which had a drop point near my place as I did not want to go through the hassles of catching a bus or an auto from KBS. Lots of operator names struck my mind. 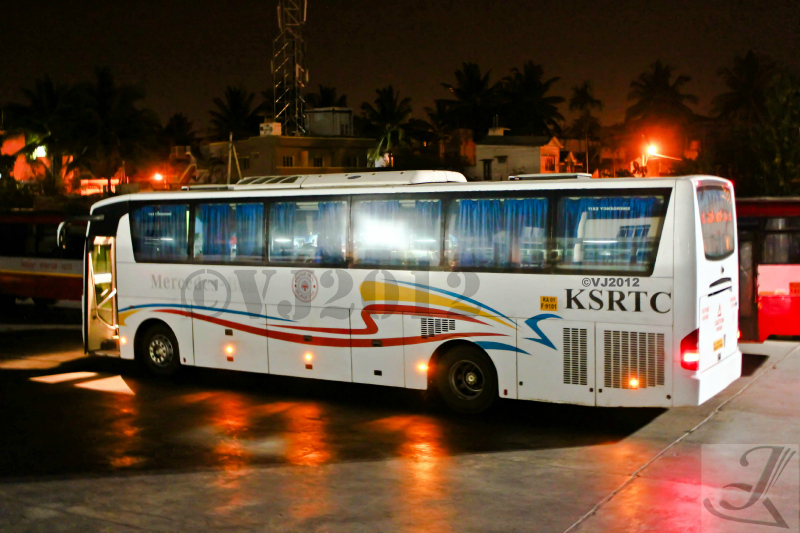 (Sugama, Vishal, Durgamba etc) My friend Mr Yeshwanth Kadri, an ardent bus fan always specified he fact that if you are traveling to or from Mangalore, always take Durgamba buses as they are known for their service. Immediately I checked their website and the buses were full. Without further delay, I decided to check the KSRTC website and found a 19:52 (7:52pm) Non A/C sleeper service to Bangalore with drop point in Vijayanagar. Bulls Eye...!!!! However there was a problem. The single berths (both Upper and lower berths) were booked but the double berths (both upper and lower) were empty from berth number 17. Did some permutations and combinations and booked the Upper double berth number 23. The Kundapur bus stand was around 15mins journey from the place where I was staying. My friend who was on his way to Sirsi in his car offered me to drop at Kundapur bus stand. It was 7:30pm but my friend was nowhere in sight. Finally at 7:45pm he showed up and we left immediately. Exactly at 7:50pm I received a message from KSRTC informing me about the Bus number, departure time, seat number and crew's mobile number. I immediately called up the conductor to inform him that I will be coming in late for which the conductor asked me where exactly I was. The conductor had plans of picking me up on the highway as the bus was departing in a couple of minutes. Since I was not very sure about my whereabouts, I handed my phone to my friend they both had a discussion on where to drop me off. The call finally ended and my friend said the conductor has asked him to drop me off in Kundapur bus stand. Exactly at 8pm my friend dropped me off at Kundapur bus stand and left. Found a non-a/c sleeper standing at one of the bay and was about to board but something was not right. The bus did not mention the last point as 'Vijayanagar' on its destination. Upon enquiry I found the bus had already left 8minutes ago...!!!! As soon as I boarded the Airavat, I called up my conductor and told him that I was on my way to Udupi now and asked him what were my chances of making it to Udupi on time. He assured me that his bus would go to Manipal to pick up passengers so I should not be worried about missing the bus in Udupi. Later I called up my friend and gave him an earful for the confusion he created. As I was sitting in the front row seats, I could hear the crew discuss about their shifts and other depot related stuffs. Later, the driver mentioned that Kundapur/Udupi division will soon be getting Two Mercedes Multi Axle buses and he was all excited about driving the Benz bus but the conductor said Volvo was the best. (The usual Volvo vs Mercedes debate). Later I settled down and remembered the wise words from my friend. "Mangaloreans are known for maintaining time". The bus reached Udupi at 9:00pm. As soon as I got down I called up my conductor and he said the bus will reach Udupi by 9:15pm. Had a huge sigh of relief. 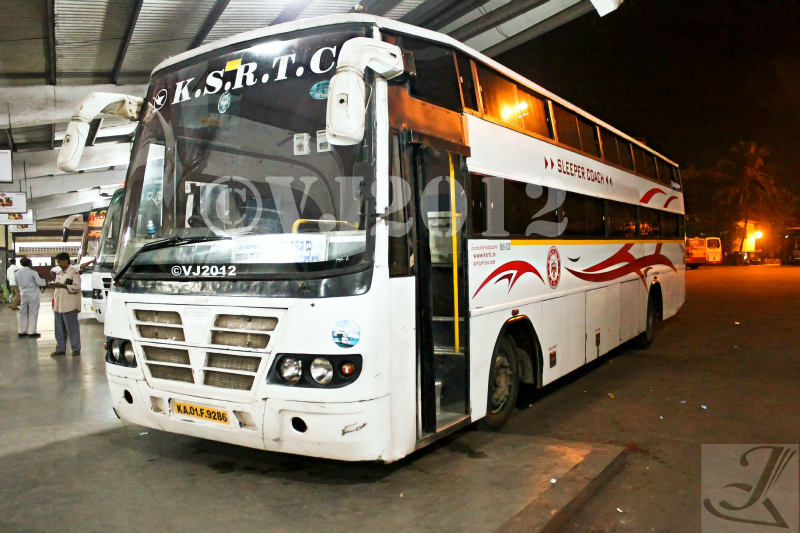 9:15pm- The bus entered the Udupi bus stand. The bus was from the first batch of Prakash built non a/c sleeper bus built on TATA chassis. The bus looked a little worn out from the outside. I boarded the bus and the crew started their questioning sessions (as expected). I apologized for the confusion and finally made my way to the berth. The interiors of the bus were top class. The aisle was spacious and not cramped, climbed into my berth and was happy to see the spacious berth. However I found the pillow in my berth missing. Since the bus was empty at the rear, went over there and flicked a couple of pillows from the rear berths :) I finally settled down and now I was expecting my gamble to pay off. I did not want any other passenger next to me so that I could enjoy all the space and I would only know in Mangalore if my plan works or not. Finally the bus moved out of Udupi bus stand. The bus slowly made out of the busy Udupi bus stand and made its way towards the highway. The driver started pushing the pedal to the metal and was reaching speeds of 70-72kmph on a highway which was under construction. The suspension was top class and the U shaped beds were doing their job perfectly. The engine noise was very less and not like the one I experienced in my journey in Corona Sleeper. However the pillow was same "Rock Solid". The bus reached Mangalore at 10:35pm and the moment of truth arrived. The bus halted for around 20minutes in Mangalore and there was a line of buses heading towards Bangalore. I got down and decided to take few pictures. 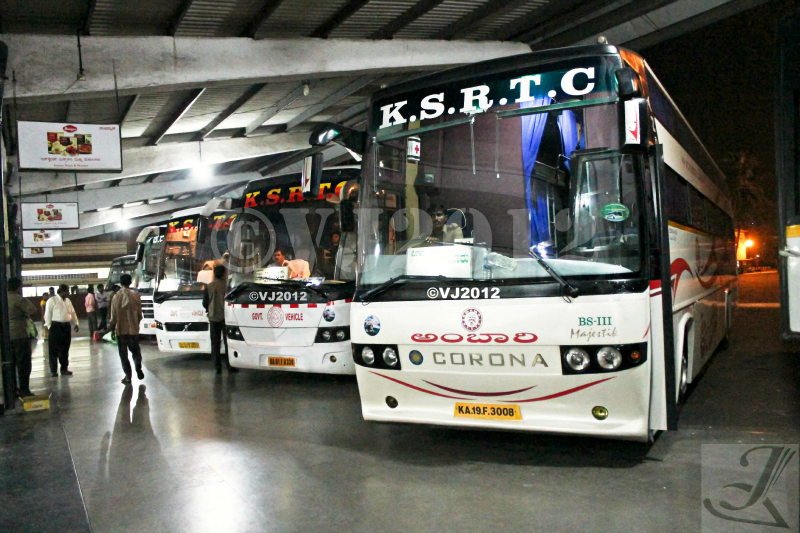 Bangalore bound buses ready for departure at Mangalore Bus Stand. Spotted the Veera built non a/c sleeper bus also heading to Bangalore (Jayanagar). But for some reason I felt my Prakash built bus looked much better in-terms of looks and built quality when compared with the Veera bus. Bangalore(Jayanagar) bound non a/c sleeper departing from Mangalore Bus Stand. My bus, Vijayanagar bound non a/c sleeper at Mangalore bus stand. 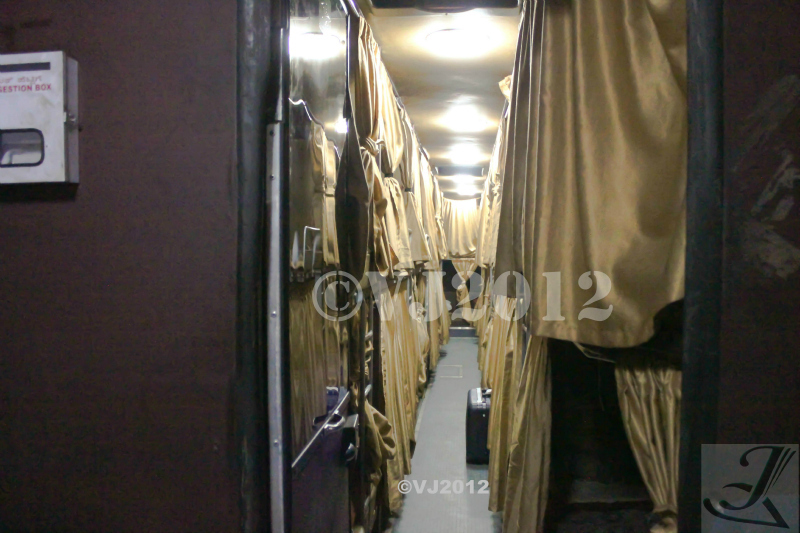 Interiors of Prakash built non a/c sleeper bus. We picked up few passengers and finally the bus departed around 11pm and went through PVS, Jyothi and finally Pumpwell circle. At Pumpwell circle, couple of passengers boarded the bus here and finally I decided to get some shut eyes. The suspension was just amazing and I hardly felt the bus negotiating the pot holes. But the real test was in Shiradi Ghats. I decided to wake up (if possible) to see how the bus handles the Shiradi Ghat and went to sleep. I woke up at 2:30am and the next thing I saw was the bus was right infront of Sakleshpur bus stand. I had slept all through the ghat and I hardly felt a jerk. When I looked out the window all the front engine runners such as Durgamba, Sugama, Sri Durgamba, Vishal and couple more buses were resting after climbing the ghat. However our bus did not stop and made straight for Hassan Bus Stand. We entered Hassan bus Stand and the bus stopped for a 10min bio break. The conductor specified the bus will not be stopping anymore and it would be a non-stop ride till Bangalore. Mercedes Benz bus stopped for a break in Hassan Bus Stop. I went back to sleep again and the next thing I remember is the bus nearing Gorguntepalya, looked at the time and it was 7:10am. The bus pulled into KBS and most of the passengers got down here. We left KBS and I was dropped off at Vijayanagar at 7:30am. Apart from the initial confusion (Thanks to myself and my friend), the journey overall was fabulous. The bus was very well maintained and needless to say the crew was really friendly. However I felt the Sakleshpur-Bangalore stretch was covered at a slow pace yet this service is recommended and if need arises, will try this service again.